(Bloomberg Opinion) -- For the first time in four years, the U.S. Commerce Department may be on the verge of reporting a gross domestic product number that tops 4 percent. The Federal Reserve Bank of Atlanta's widely followed GDPNow index, which aims to track growth in real time, indicates that the economy is likely expanding at a 4.49 percent annualized rate this quarter. If that number ends up being in the ballpark, the implications would be profound. First, the odds would rise that the most optimistic growth forecasts for this year would be realized and the current economic expansion will likely extend to June 2019 to become the longest in U.S. history. Also, the midterm elections would probably not be the slam dunk for Democrats that political strategists currently envision. A strong economy could be a sufficient swing factor that prevents Democrats from winning back power in Congress. On the surface, a break from the recent pattern where strong growth in one quarter is followed by subpar results the next seems wholly achievable, especially with the unemployment rate having plummeted to such lows that commentators find themselves drawing parallels to the Kennedy administration. And yet, as difficult as it is see, the issue is one of a backdrop that is too good to be prolonged. It is true that in certain industries employers cannot source the workers they need to satisfy customers’ demand. It is also true that when they do get their hands on the requisite warm body, it is costlier than it’s been in years. Wage inflation is alive and well in certain industries, and therein lies a challenge for managers to overcome. Some of the best insights into the overwhelming demand for workers can be gleaned from the less-followed but rich data published monthly by Challenger, Gray & Christmas. The firm is best known for its data on layoffs, but its monthly hiring announcements provide great information on the bottlenecks in the labor force. The big picture is stark. Hiring intentions this year are off by almost half compared with 2017, driven by a collapse in the demand for workers in Information Technology, Entertainment & Leisure, Telecommunications and Retail. What little demand there is can be seen in some of the industries that have the smallest pools of available workers such as Construction, Energy and Electronics. Passing along increased labor costs that come from filling open positions to customers is the preferred path for employers, but that has been easier said than done. So, those costs must be mitigated. Non-labor costs can be cut, but that avenue has been pursued to its extremes. Another option entails boosting leverage to carry the increased labor expense, but if the added debt to cover incremental costs hits its natural limit, companies make their way to the final source of margin relief: mergers. Some $1.27 trillion of mergers and acquisitions have been announced in the first five months of the year as companies seek synergies, a record for that period, according to data compiled by Bloomberg. Companies are clearly in damage-control mode as it pertains to protecting their margins, even if it means sacrificing corporate cultures via a forced marriage. Although there is a natural order to cost containment efforts, life doesn’t always conform to a chronological script. Oftentimes, solutions are pursued in haphazard fashion as managers scramble to react to a margin squeeze. 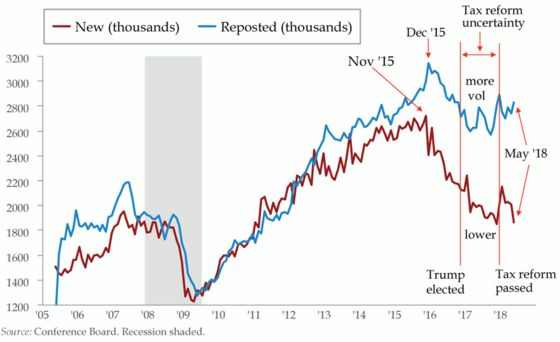 This inherent tension is reflected in Conference Board data on job postings, which have been on a steady decline since peaking in November 2015. 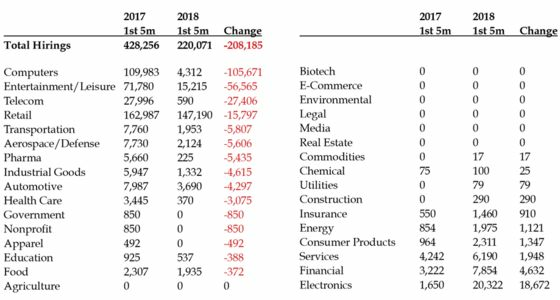 As difficult as it is to imagine, big parts of the underlying economy have been slowing even as the industrial sector gets juiced by a weaker dollar, the worst year on record for natural disasters in 2017 and fears of a trade war erupting. The same cannot be said of job re-postings, which are open positions that are re-posted if they’re not filled. Those postings have jumped , reflecting the surge in demand for skilled workers. One thing is certain: the gap between the new job postings and re-postings will be resolved as companies take steps to contain their labor costs. A miracle manifestation of skilled workers to fill the open positions would validate economists’ rosiest forecasts. But miracles are rare. The likelier outcome entails the disruption of the illusion floating markets today.